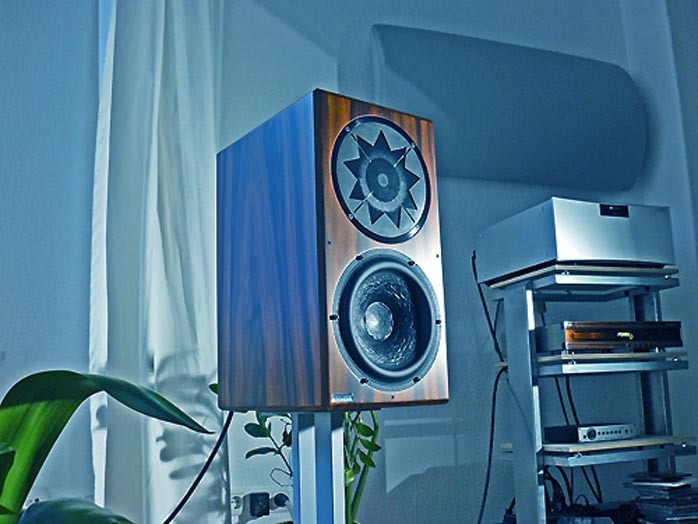 This review first appeared in the May 2008 issue of fairaudio.de and can be read in its original German version here. It is herewith translated and presented to an English-only audience through a mutual syndication arrangement with fairaudio.de. As is customary for our own reviews, the writer's signature at review's end has a link below it to his e-mail should you have questions or feedback you wish to send. All images contained in this review are the property of fairaudio.de. - Ed. "I left a bag in Berlin." For firm Manger in Mellrichstadt, this refrain counts double - and not because of the pair of Zerobox 109s they loaned us for audition which have naturally long since been returned. Nor for however many Manger units might take up proud residence with happy Berliner audiophiles. No, the 'suitcases' I meant are quite a bit larger and visible to anyone who enters the music club Raumklang in the Friedrichshain district. Or, news to me I should add, who visits a particular church which just so happens to sit around the corner from fairaudio. Naturally, I followed up with this Church am Süd Stern where good sound and music are part of sermonizing. Their sound technician Max Knecht divulged that for 20 years, one had relied on Bose until their speakers began to regularly dispense 'dandruff' and -- after a particularly fierce hiccup with screaming microphone feedback -- caused an outright rain of disintegrated surround foam bits. Replacements were in order. 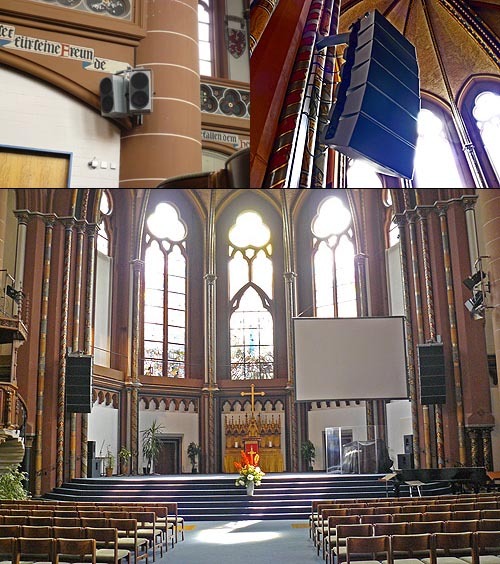 After due investigation, Manger was approached for a complete sound distribution solution which included 500 square meters of sound absorber panels. Though naturally beset with long echoes, I was quite impressed with a brief audition there and the resident team continues to be satisfied with the results of their 2004 installation. Which segues into today's report, albeit of something smaller, 48 x 26 x 36cm HxWxD and 21kg to be precise - Manger's entry-level model, the physically quite mature rather than minuscule Zerobox 109IIe. Unless I somehow missed it, the upscale reputation which Manger enjoys in recording studios and hifi systems isn't the result of large-scale propaganda efforts. Rather, it's due a highly unorthodox driver concept which was no impromptu flash in the pan but enjoys deep roots back into the mid 1960s when Herr Josef W. Manger, father of present company owner Frau Daniela Manger, decided to take a close look at time-domain behavior (rise and settle times) of loudspeakers. The first patent applications followed by 1969, more in the early 70s. The original bending-wave diaphragm prototypes used nylon stocking materials so it wasn't until 1990 that formal production commenced. Ongoing refinements have led to a total of 40 patents around the world today. 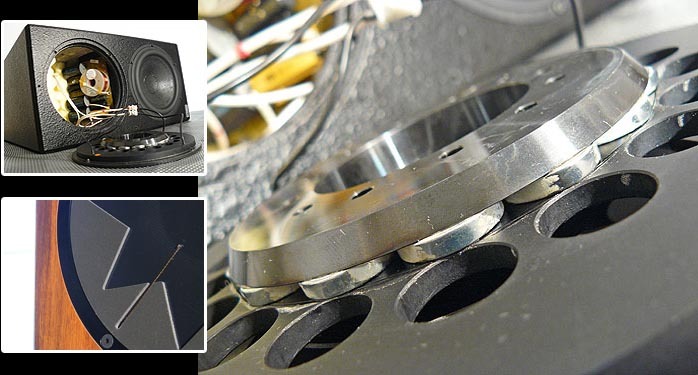 What distinguishes the 19cm-diameter Manger driver is the absence of surround and spider suspensions to create its signature bending waves, a sound propagation principle that's diametrically opposed to conventional cones 'n' domes which idealize ultimate stiffness to operate as theoretical pistons. Said bending waves don't arbitrarily crisscross the driver either but begin their concentric ripples from its center just like a lake responds to a thrown stone. In the Manger, high frequencies exhaust their activities quickly to never make it to the edge while low frequencies set the entire surface aflutter. This is in response to a membrane structure that's been deliberately contoured in mass and stiffness from center to edge to result in a highly phase-accurate recreation of even very complex input signals. Manger's signature deflection star shape is no frilly design exercise. It absorbs the lowest frequencies which make it to the outer edge where they'd otherwise reflect back. Acoustically, the possibly strange-seeming bending-wave transducer counters with specific advantages: speed as in rise times - 13 microseconds, with equally short settle times to curtail ringing. Given that the Manger can be run exceptionally wide (its 20cm woofer companion in the Zerobox 109IIe takes over at a low 150Hz), it naturally approaches the point-source ideal with the timing fidelity inherent in that concept. Whether such time-domain accuracy actually matters to the ear/brain is a contentious subject. Frau Manger would add that "auditory physiology research has meanwhile established that the human ear resolves timing cues down to 10µs (100kHz)!" Personal experiences with time-coherent speakers (also reference the terms impulse and step response) have been positive, hence my occasional mentions on the topic; never mind that my Thiel reference speakers give more than lip service on the subject. To get right to the point, a mere special effects freak the Zerobox 109IIe certainly is not. Casual background A/Bs alone clearly won't have you any wiser as to what constitutes this speaker's special virtues. The more I listened though, the more I liked and admittedly, certain qualities were quite obvious from the start. 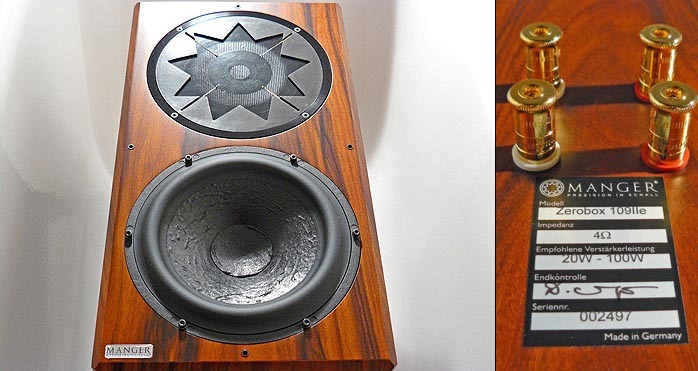 This speaker is unquestionable equipped with accurate timing to belong into the 'fast' category of the transducer guild. Excellent though involuntary proof thereof came at the hands of Frau Daniela Manger herself who, after delivery, asked for a brief audition. "Fading Maid Preludium" by Swedish Jazz combo e.s.t [from Tuesday Wonderland] meanders for about 50 second through fluffy piano noodling before double-bass and percussion kick in brashly and without notice. I'm quite certain that many loudspeakers would not have caused Frau Manger's shocked jerk reflex quite as violently. So, rhythmically endowed music poses - um, zero challenges for the Zerobox 109IIe. Needless to say, isolated heart attack heroics are insufficient to render comprehensive judgment. Further discs were called upon. Think 2006's Big Picture by US pianist Myra Melford who has released a number of satisfying albums to these ears. Big Picture is exceptionally virtuoso playing and the opening track "brainFire and bugLight" kicks off in style. Whether rapid drum whirls, heated key attacks or deft double-bass plucks, the Zerobox 109II2 doesn't miss a beat. In matters of PraT, this sealed two-way is very compelling. This includes precisely articulated bass which is endowed with fast reflexes, claimed to reach 40Hz at minus 3dB and completely resistant to any low-frequency coagulation. Another range that quickly explains itself with the 109 is the midrange. It isn't merely on the money in time but impresses with realism and strong tone colors to benefit not just acoustical instruments but particularly voices: fetchingly rich, silken and highly intelligible. Yes, this is patently exceptional. The 109 also proved sonic realism with another test when Coil begins its song "Where are you?" [Music to play in the Dark] with the rapidly sequenced farts of packing-sheet air bubbles being popped. That this actually does sound like small air bladders bursting rather than generic synth effects is far from a given and contingent on the quality of the playback chain. For what it's worth, the Zerobox aced the bladder test with flying colors. Another Manger strong suit is staging, something it arguably shares with other time-correct speakers. It is sharply localized, holographic and well sorted even during dense sonic thunderstorms, albeit not fully extended downward to the floor but -- at least to my sensibilities -- a bit elevated as though on a low podium. I felt irritated at first but longer acclimatization without A/B comparisons got me over it fully. The Zerobox 109IIe is clearly a long-distance listening tool: seamless, warm, colorful and, despite its supreme attack-on-demand reflexes, harmoniously fluid and effortless. It's these virtues in my experience which determine sonic satisfaction over the long haul - or whether the new hifi acquisition will soon turn lamented one-night stand investiture instead. That the arguably softened treble of the Zerobox doesn't prompt the latter won't be news to those who've been around the block a few times. Outright crisp on top the Manger clearly is not. Canadian Indie rockers Arcade Fire (on their Neon Bible album, a justified critics' darling if not audiophile wonder) incorporate some authentic symphonic elements compliments of the Budapest broadcasting station. With the 109 walking its leash, the song "No Cars" was of a piece and fluid, with very intelligible vocals but brass players who were less radiant and blatty than perfectly true. The hi-hats too usually cut through better and whether it's a snare or tom remains easier to sort out with my Thiel CD 2.4's more powerful presence illumination. Are you an aficionado of sonics spectacular? Do you desire abject exactitude and analytical openness on top? Then a happy liaison with the Zerobox 109IIe could be ultimately doomed. Should you value musical flow however, long-term suitability, dimensional staging, fleet-footed PRaT and an exceptional vocal band above all else, then the Zerobox becomes one of the highest recommendations known to me. Be that as it may, brain-freeze A/B comparisons won't fully plumb the depths of the Zerobox's special qualities so Manger strategically allows for 10 days or longer in-home auditions to fall into step with its goods, something I recommend you take them up on. An equally fast and fluid, i.e. perfectly timed demeanor. An utterly seamless, integral sound picture even with shorter listener distances and smaller rooms. A three-dimensional, well sorted soundstage. A colorful, warmish yet ultra precise midrange with excellent enunciation and intelligibility. A bass characterized more by precision and speed than sheer mass but of sufficient substance for rooms up to 30m². A somewhat gentle rather than analytically extended treble. Frequency response: 40Hz to 25kHz (-3dB). Dimensions and weight: 49 x 26 x 36 cm (H x W x D), 21 kg/ea.